Within the pages of Hycel Lee Peterson and Kenneth Bernard Peterson’s new book, Hycel’s Story, ($12.49, paperback, 9781545609668; $5.99, e-book, 9781545609675) readers will discover a compilation of writings stemming from Hycel’s desire to write a book that would shed light on some of the injustices committed against his family, friends, and neighbors in the post-depression rural south. Until now, this mostly consisted of handwritten notes stored in a briefcase, but Hycel has now realized his dream of telling his story. Above all, the authors encourage leaning on the Lord to find forgiveness instead of simmering in bitterness. Hycel is an eighty-five-year-old African-American masonry contractor. Kenneth is self-employed in the field of health and human services and holds a degree in journalism and communications. 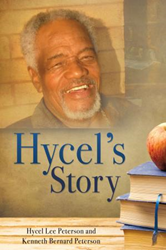 This is their first book and has helped Hycel to realize his dream of telling his story. Xulon Press, a division of Salem Media Group, is the world’s largest Christian self-publisher, with more than 12,000 titles published to date. Retailers may order Hycel’s Story through Ingram Book Company and/or Spring Arbor Book Distributors. The book is available online through xulonpress.com/bookstore, amazon.com, and barnesandnoble.com.